This summer I was spending a lot of time in big European cities and saw so many people careless about their belongings. 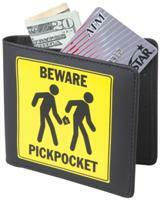 There are so many pickpockets out there and you should always be aware about it especially in in crowds. Beware of crowds. Be particularly cautions on trams, buses, subway, when visiting sights, in harbours, at markets and restaurants, beaches and other public places. Always carry your bag zipped up or closed and preferably carry it in front of you. Keep your money and bank cars in you pocket at all times. Beware of people impersonating policemen. Never obey a stranger’s request to show your wallet.